Holes : 18. Length : 6353mts. Par : 72. 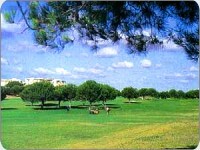 Features : The ponds, streams and Atlantic pines of Pinhal Golf Course blend with the rolling parkland terrain to provide a fair golf test for all. Facilities : Driving range, putting green, club hire, electric trolleys, buggies. Location : Skirts the centre of Vilamoura. See Map.